There are a number of rules that Associations can apply to how clearances are managed. For example, rather than manually approving or denying every clearance that is requested, associations can automatically approve or deny certain types of clearances, or player clearances within certain age groups. 2. Under 'Setup Registrations' click on Clearance Settings. The List of Clearance Settings will appear, showing any existing clearance settings that have already been set up. On the right hand side, click on Add. A blank Clearance Settings screen will appear. Below is an overview of each option on the Clearance Settings screen. c. Rule Applies to (compulsory): Apply the auto approval rule (point 3) to clearances where players come in to the Association ('Inward Only'), players leave the association ('Outward Only'), or for all inbound and outbound clearances ('Both Ways'). d. Default fee for auto approval (optional): If a clearance fee needs to be paid, add the amount into this field. e. DOB Start Range (optional): enter the start of the date-of-birth range that the auto approval rule applies to. f. DOB End range (optional): enter the end of the date-of-birth range that the auto approval rule applies to. 4. Enter the details for your clearance settings and click on Update Settings. A confirmation message will appear. 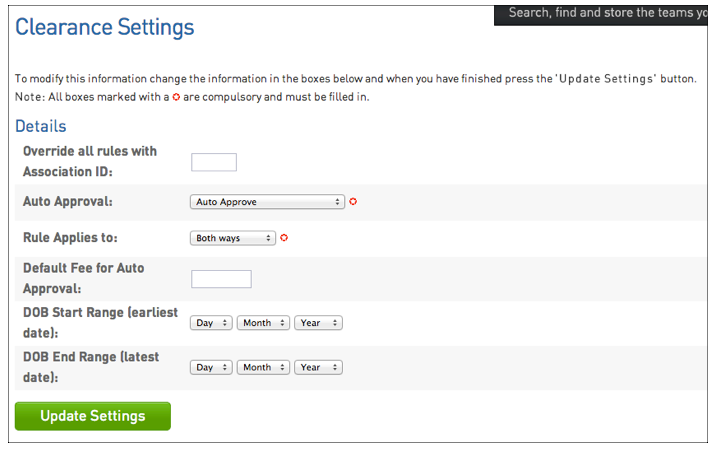 The clearance settings will now apply to all future clearances that are processed within the association. Associations have the option of creating 'reasons' for clearance requests and clearance denials. The reasons for clearance will appear on the 'Request a Clearance' screen and the reasons for denial will appear on the 'Approve/ Deny a Clearance' screen. Reasons for clearance requests and clearance denials can be set up through the Configuration area > Manage Lookup Information.